Cycling the Atlantic coast of Europe from north to south during the summer of 2017. View the archive, the route so far, or donate to MSF. I woke and packed. I rode over to San Fernando train station. I was able to show the full itinerary of my train trip to the lady at the ticket office as Thomas had sent it through to me. It was really easy. Thomas had also checked that there was free space for my bike so my bike had tickets too. The train arrived from Cádiz on time. 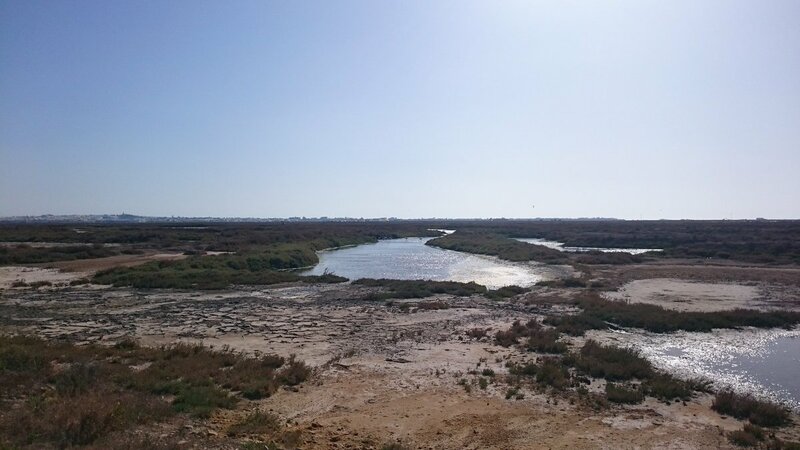 I changed just south of Seville as Thomas had told me. 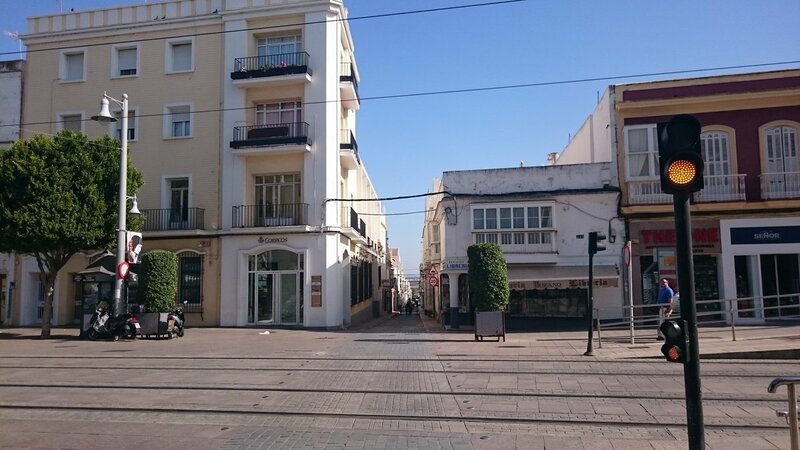 I got to Málaga by early afternoon. The flight home was around 9pm but I had to bag or box my bike somehow and get to the airport. The first bike shop I tried to find from Google Maps didn't exist. Or if it did I couldn't find it despite going all the way around the block. I headed back through central Málaga and eventually found a bike workshop and cafe. This felt like the right place. I sat in the cafe and had a curry. I got 10% discount because I'd arrived by bike! 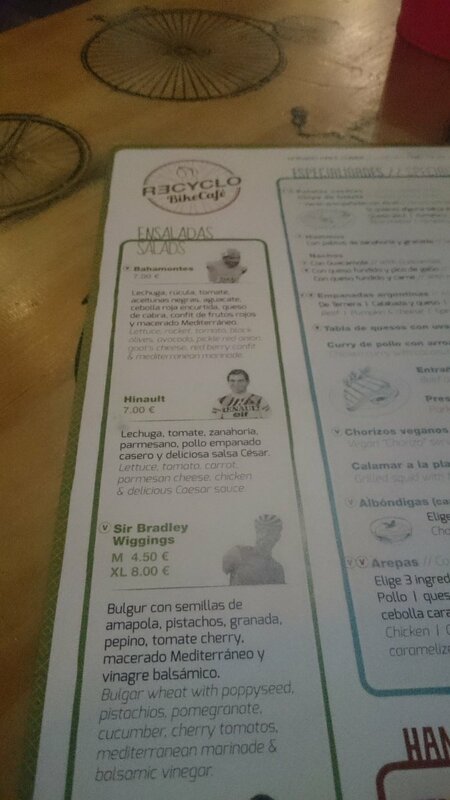 Does Bradley Wiggins know he is a salad at the bicycle themed cafe in Málaga? After food, the guy running the bike shop offered me a large cardboard box that he'd had a bike delivered in. I then spent a bit of time with tool taking my bike to bits, cutting down the huge box, and packaging it all up with bubble wrap and parcel tape from a Chinese bazar around the corner. My rucksack was taken out of the IKEA bag to be hand luggage. My pannier bags were put inside the IKEA bag for hold luggage. I then had to lug the whole lot across central Málaga to the train station to get to the airport. That was the hardest part. After four months of carrying me and my bags, I was now carrying the bike and bags. That isn't easy. I had to keep stopping for rests. Just before the station a kind couple offered to help me which was very nice of them. I got a train to the airport. I'd been expecting there might be issues at the airport but everything just worked. I rang my dad via Skype. He told me my sister has gone to pick me up from Manchester which was odd because my flight was to Leeds. He told me I better ring her but then Skype stopped working for me. Minutes before boarding I was able to find out that he'd actually got it wrong and she had the right airport after all. The flight itself was very busy. No doubt the end of Monarch and the recent pilot disputes meant every flight in the south of Spain was jammed full. Passengers were getting in and out of their seats to chat and were holding up the flight in the process. Once we were airborne the crew ran out of most refreshments and food so people got a bit tetchy. The couple sat next to me weren't talkative and the man across the aisle said something about "it's political correctness gone mad" and I decided to sleep instead. It was the worst flight I'd been on in a while but I was going home. My cycling was done. I had completed the Atlantic coast of Europe. I woke and saw Txema before he left at 8am. He said everything would be OK and he'd call the hostel at 10am with news. The hour arrived and the phone rang. It turned out I'd have to wait until 3pm to hear if the courier had picked up the passport. That was five hours away so I had an enforced wait. To pass the time I wrote the 30 postcards I'd bought in Tarifa and then visited a post office to post them. I ate. The hours slowly drifted by and my anxiety rose. Just after 3pm, Txema arrived at the hostel. He didn't look happy. Apparently the campsite had refused to hand over the passport; the daytime receptionist had said they knew nothing about it. The courier option was gone. By this point, so was the bus option as that had gone at 3pm. A taxi would cost €100. 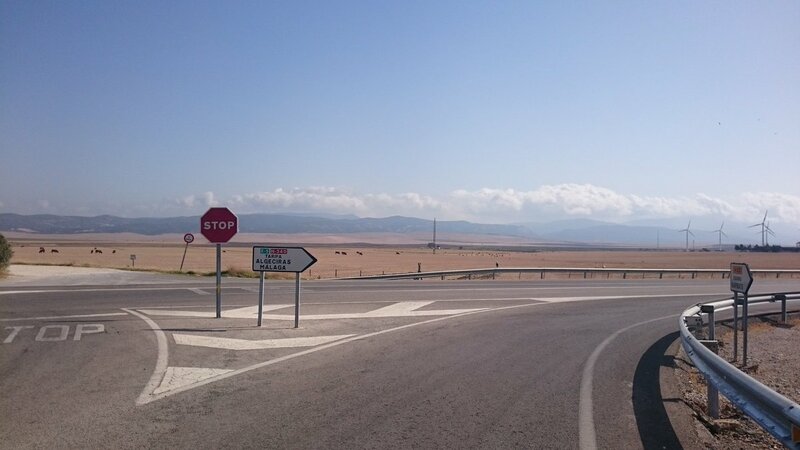 Both those options would have brought me back to Algeciras anyway, leaving me 160-180 km to go to Málaga tomorrow. I called my friend Thomas Robitaille on Skype. 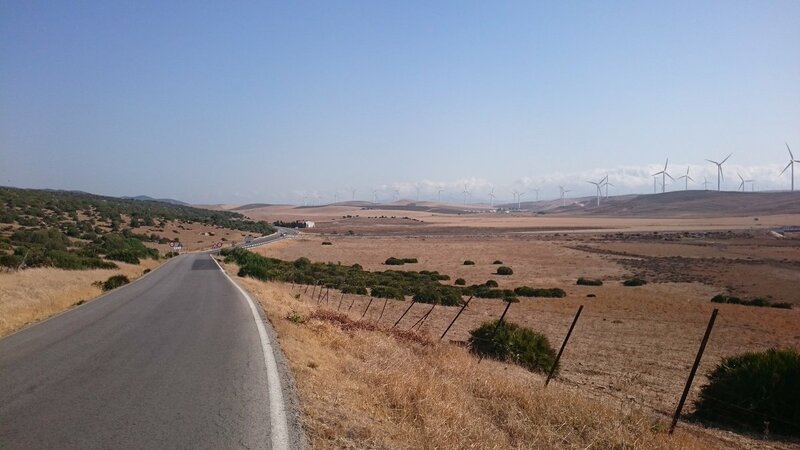 I told him I was just about to cycle 100km back the way I'd come and asked if, whilst I was doing that, he could find me options from Cádiz or San Fernando. I apologised for the brevity of my call but I had to be off as time was running out. This was by far my latest start to a day's cycling. The only saving grace was that at least the easterly wind would be helping me today. I rode back up the 325 metre hill from last night. 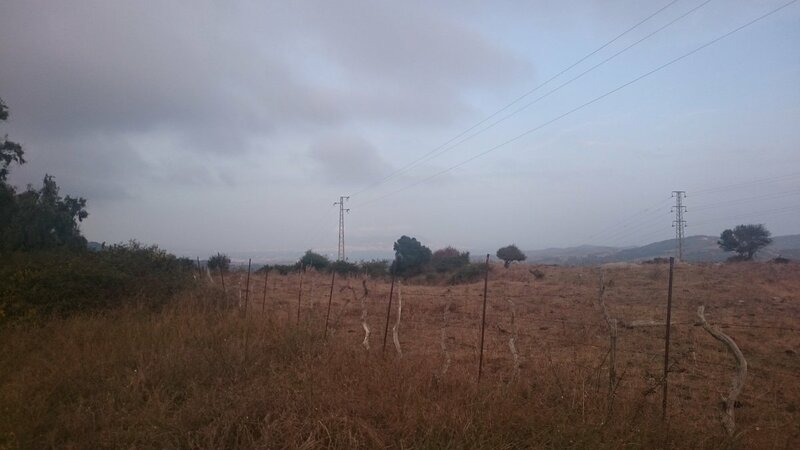 A couple of kilometres from the top I hit the annoyingly long Spanish roadworks. How I'm supposed to cycle uphill through road works in the short amount of time they allow I have no idea. I was being entirely driven by anger now. I was angry at the campsite. I was angry at the road works. I was angry that the wind had died down after the exhaustion it had caused me yesterday. It was the only emotion left to get the adrenaline pumping. I rode fast. I rode up between the wind turbine army. I rode through forest fire smoke that was covering the plains. The sun was dropping. I pushed hard. 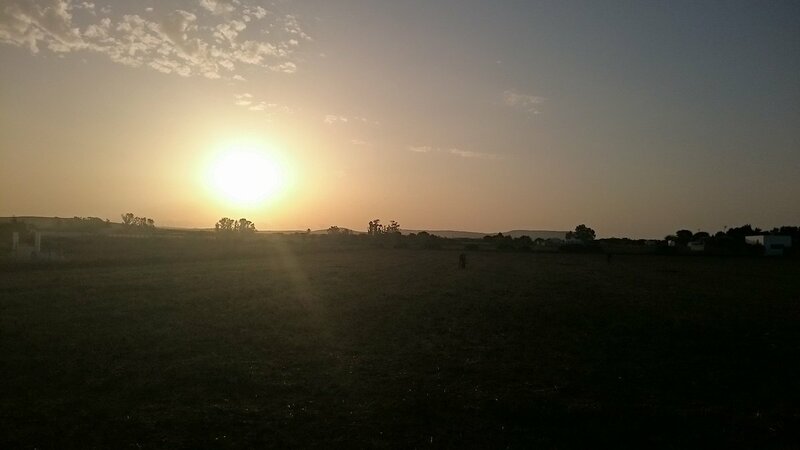 At the sun started to stroke the horizon I reached the campsite. The night receptionist was there. In our broken French I explained that I'd had to cycle 84 km to get my passport. I said the daytime man was a "bad man" but shook the hand of the night receptionist and thanked him for giving me back my passport. I checked in with Thomas. He'd found me multiple detailed options to get to Málaga tomorrow via San Fernando. It was so nice to have someone working out that stuff. I jumped back on my bike and found a supermarket in Concil de la Frontera where I tried to fuel myself up. Whilst sat on the ground outside the supermarket stuffing my face, a backpacker came up to chat. She told me that her boyfriend had said a rain storm was due to hit around 8pm. There wasn't much I could do about that. I needed to push on regardless. With waterproofs on and my lights on, I headed off into the dusk. This was my first time cycling at night on my trip but I had the advantage of having been down these roads two days before in the opposite direction. I remembered the shopping street (although going this way I had a nice bike lane for that part). I remembered the double petrol station. 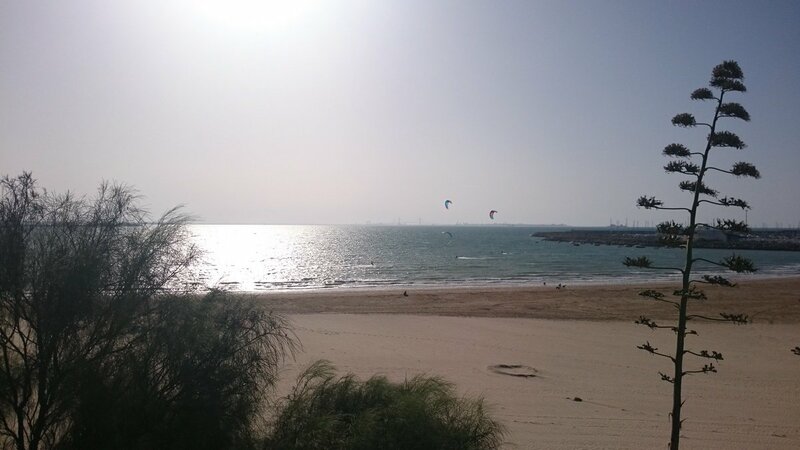 I remembered Chiclana de la Frontera. I remembered my way to the path next to the tram tracks across the salt flats. I finally arrived in San Fernando and tried a few different hostal/hotels before finding one that was affordable. The lady on the reception there was very nice and switched my room to the ground floor when she realised I had a loaded bicycle. She let me take it into the room. I ate. I got rid of some things I would no longer need. I checked Tom's plan for tomorrow morning. My niece sorted out my online check-in for the flight for me. I could finally rest. Sure there were still things to do tomorrow but they could only be done then so no need to think now. I wasn't capable of thinking about them anyway. The anxiety abated. I awoke and packed my tent. By 9am I was stood with my bike at the little campsite reception ready for it to open. I was still tired and I knew I needed to get this sorted and away. My head was filled with thoughts that today was when I would finally reach my goal of the past four months. 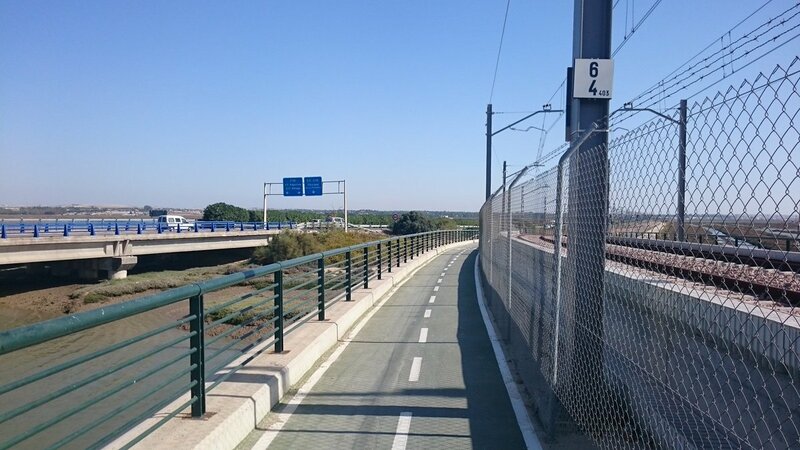 I was trying to ignore the issue of cycling perhaps 180 km to Málaga in time for the flight on Wednesday night. I needed to get my passport back. A different man opened the reception. This was the daytime receptionist; not the friendly, French-speaking, man of the night before. Daytime man didn't speak any language that I did so communication was hard. He seemed to be wanting me to pay for the camping. We had to go through a pantomime of me trying to point out that he already had my money (my €10 was paperclipped to my paperwork). It turned out that that €10 had been a deposit for the key fob I'd been given to get in and out of the campsite. Eventually he was convinced to keep that as payment (I didn't persist to get the few cents change I was due). As I was about to go he reminded me to hand over the key fob. I was clearly barely functional at this point. I was just glad to be going. On leaving the campsite compound (every campsite seems to be safe from zombie attack in Spain and Portugal) I was back in the wind. This was the edge of Hurricane Ophelia that was currently heading up towards Ireland. I'd been hoping that would mean the wind was from the west but, as always, it wasn't. It gave me a 20-30 mph gusty wind from the east. My last day would be against strong wind. 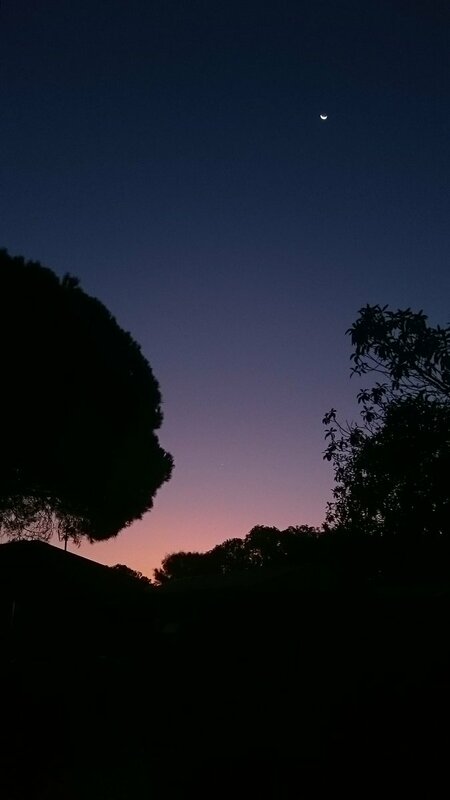 A kilometre or two down the road, at Zahara, were two campsites that were clearly open. So much for my worries about a lack of campsites last night. There was a little Coviran supermarket where I stopped for supplies. 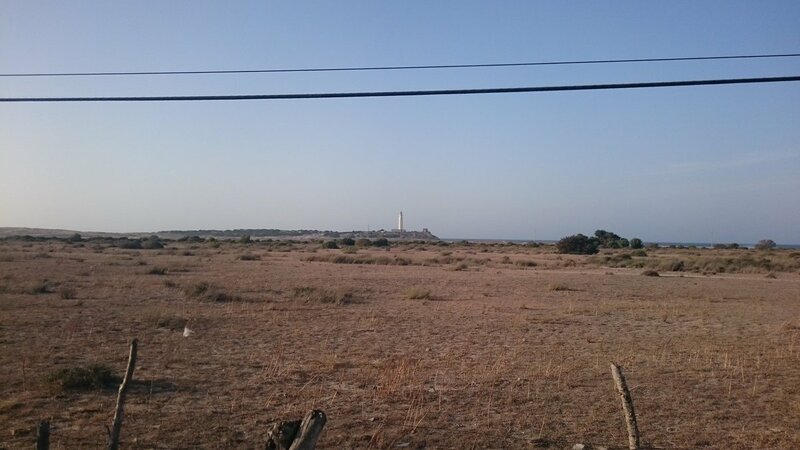 I headed along the coast past Trafalgar (yes, that one) to Los Caños de Meca. Here my GPS seemed to suggest there was a coastal path. I went to the start of it. It was sand. Probably passable if you were on a wide-wheeled mountain bike with no luggage but I wasn't. I headed back to the main road. 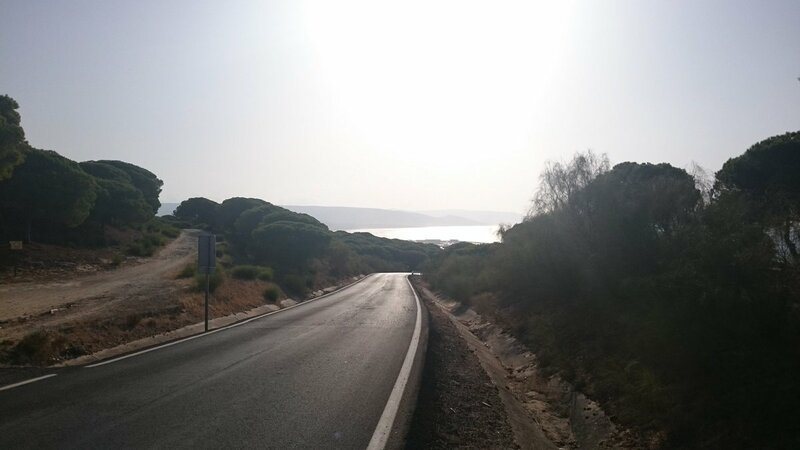 It went up to 135 metres through a Parque Natural before dropping down to Barbate. After stopping at Lidl, I had flat roads for a while. That was good because I was also fighting the wind. On this stretch, the nice looking beach was off limits as it was a military area. At Zahara de los Atunes my route went inland because the coast road didn't seem to join up south of Atlanterra. Giant wind turbines came into view. They were spread across the landscape ahead of me like an army. They were all facing the same direction - the way I was headed - and were spinning fast for structures of their size. Oh great. The elements were really trying to give me one last obstacle to endure. They were going to make me earn the end. Good weather for wind turbines. Not for me. Really dangerous gusts. Heading north east meant the wind was partially from the side. That meant I had to keep stopping myself being pushed into passing cars. It took a lot of effort. It felt as though the wind was trying to sap every last tiny drop of physical and mental energy from me. Eventually the road took a 90 degree turn and headed south east. That still had the same problem with being pushed sideways but with the added problem of the wind suddenly stopping every time a vehicle went by. Leaning into wind that suddenly stops is pretty dangerous as you fall towards the vehicle stopping it. Eventually, I had to get off and walk despite it being flat. Here I met Stefan who had cycled from Cologne in Germany. He had been forced to walk too. 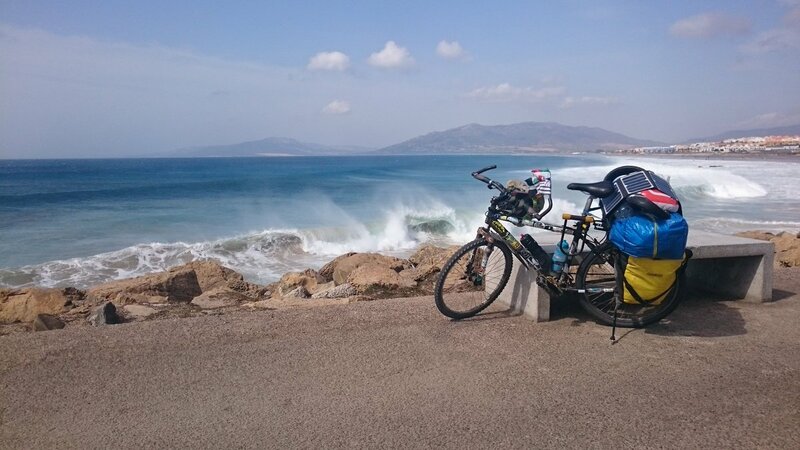 He wasn't sure if he would reach Tarifa today. A sign to my destinations. Stefan who had cycled from Cologne. Closer to Facinas the mountains provided a little sheilding and I was able to get back on my bike. I must have climbed uphill as I now had a pleasant downhill giving me a little break. Tarifa was approaching. I was close to collapse. I would reach it. I would. But first I'd stop in a supermarket to buy calories. 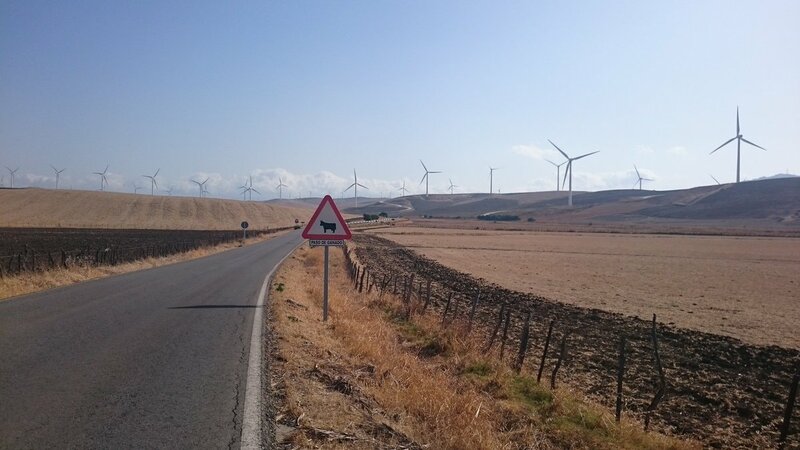 There was a sign marking Tarifa. I wasn't quite at the end yet though. Along the sea front I rode. Surfers were enjoying the breaking waves and riding the tubes. 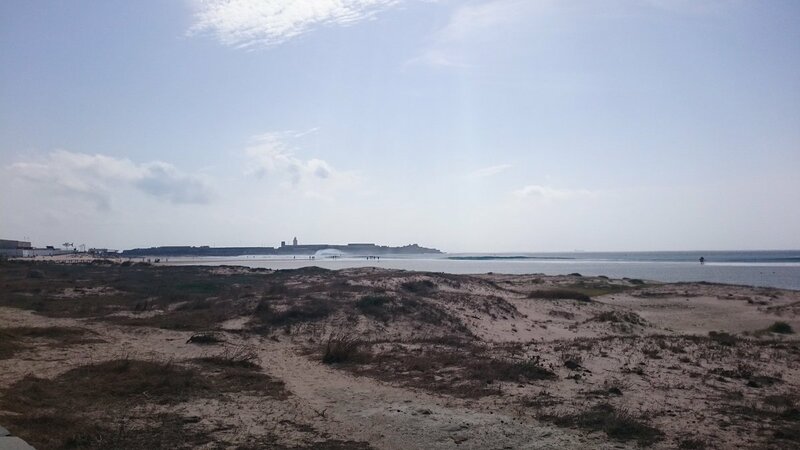 I reached the narrow spit that joins Tarifa to the little military island of Isla de Las Palomas. Ignoring the "no vehicles" sign, I rode along it to the end. 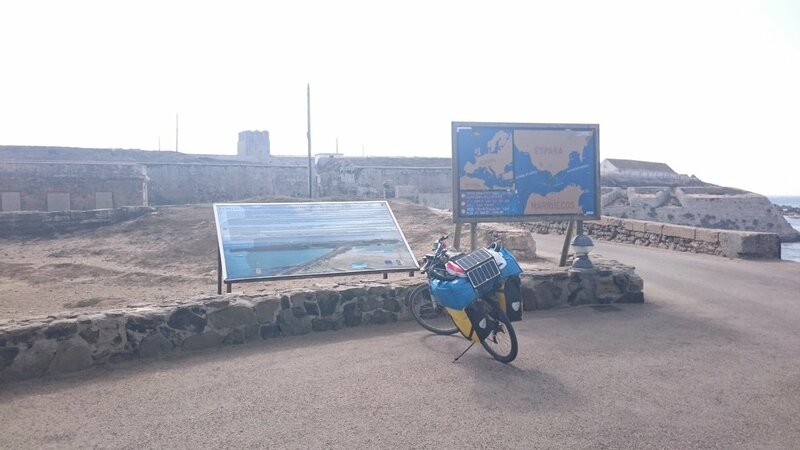 There was a rather dishevelled sign marking the southernmost point of mainland Europe. 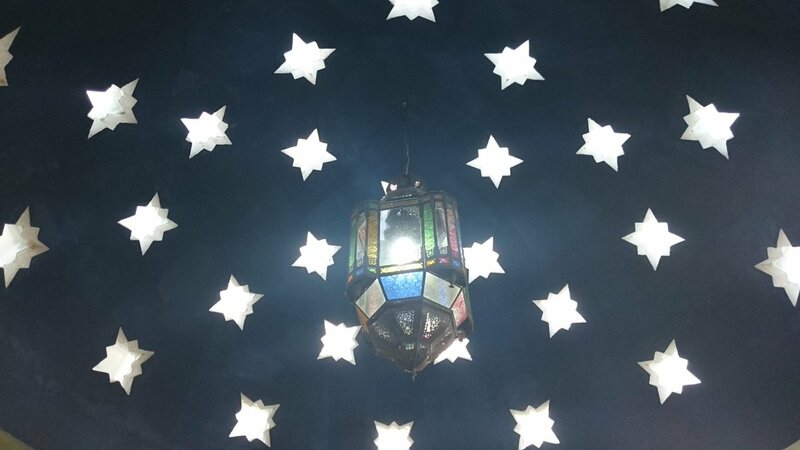 I was here. I had set off 120, long, days ago from Kirkenes. I had endured a summer of snow, freezing rain, hills, rain, midges, bike breakages, rain, exhaustion, and an unreasonable amount of head wind. But I was here. On one side was the wild water of the Atlantic Ocean. 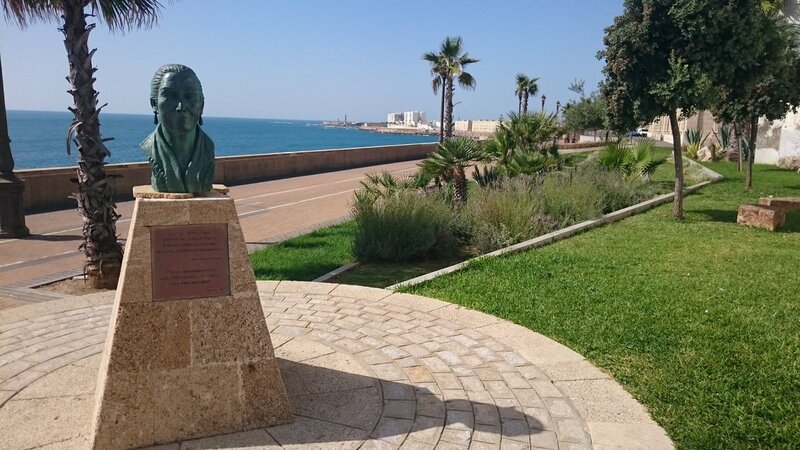 On the other was the Mediterranean Sea. All the emotion of four months of effort welled up. I sat down and cried. I had ridden the Atlantic coast of Europe. It was mine. The rather dishevelled sign marking the most southern point of mainland Europe. You can't get onto the southernmost point. All of mainland Europe behind me. I found a more sheltered spot and sat down to eat. There was a press conference online about the latest gravitational wave discovery. It was exciting news but I wasn't really taking it in. 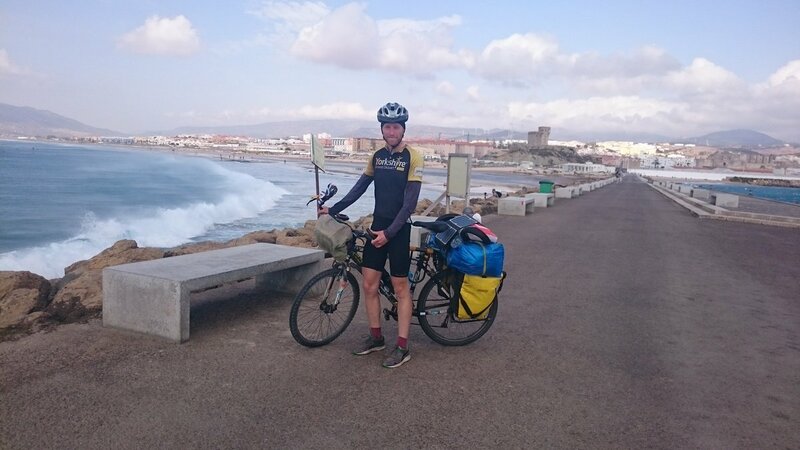 I'd just cycled the Atlantic coast of Europe. 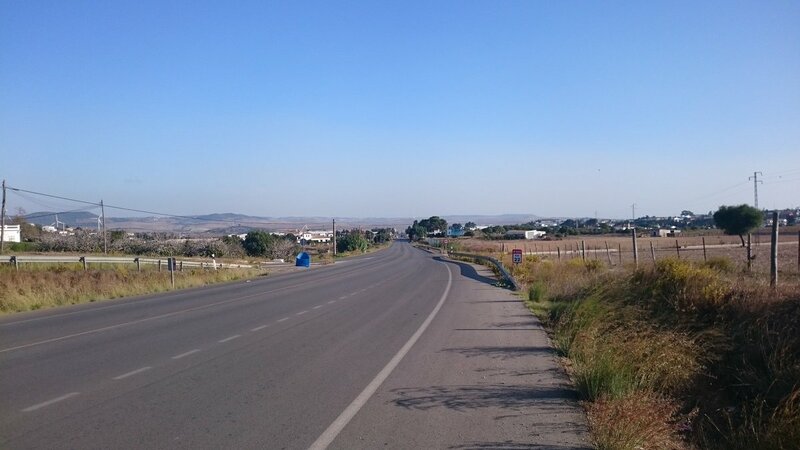 After a longer rest than normal (hey, I felt it had been earned) I realised I'd have to press on to eat up some of the 180 kilometres I needed to do to get to Málaga. 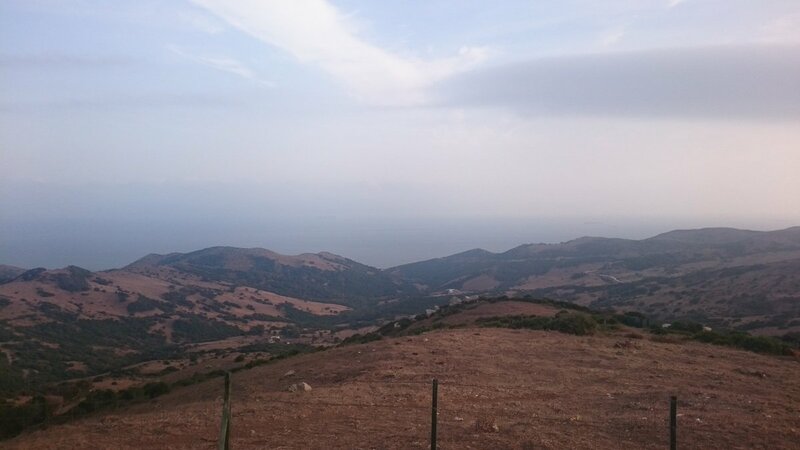 In Tarifa I bought a ridiculous number of postcards then headed uphill and out of town. The road kept going uphill. Argh. At least the wind wasn't as fierce as it had been this morning. The effort felt similar. I looked back. 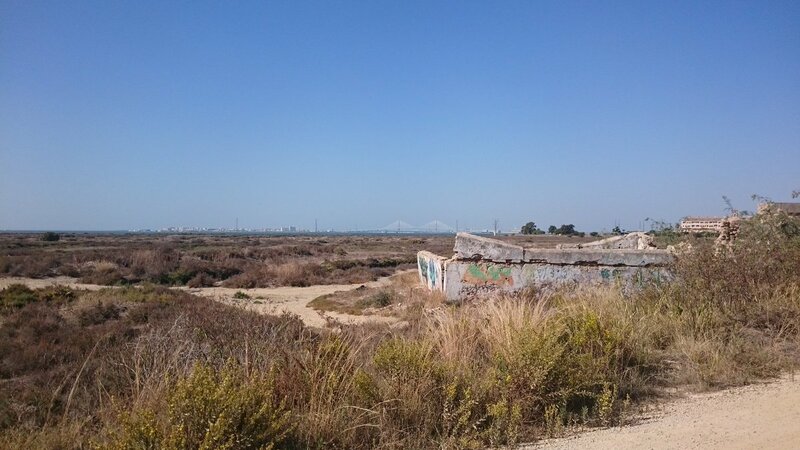 I could just about make out the north coast of Africa through the haze covering the Straits of Gibraltar. 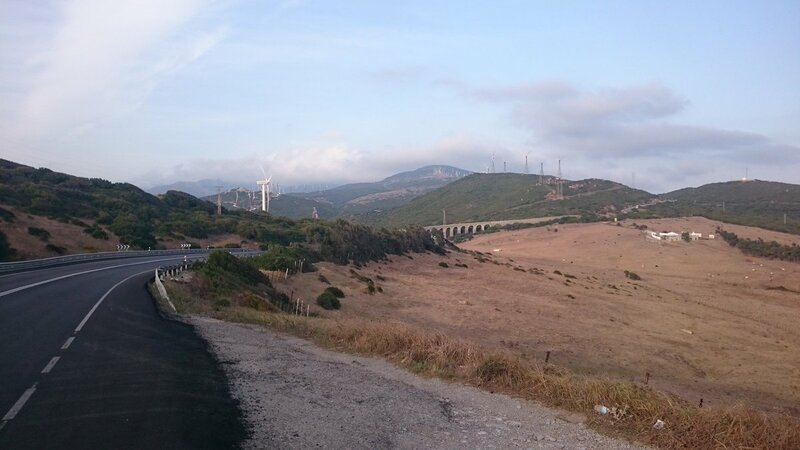 Back up into hills as I ride along the Mediterranean (bye bye Atlantic) to Algeciras. A glimpse of Gibraltar through the haze. I kept riding up. I reached 325m altitude then it was downhill... for a while until the road rose back up to 325m again. This second summit was the last. I could then enjoy a good, long, freewheel down into Algeciras in time for sunset. In Algeciras I found a Hostal. The man on reception spoke good English which was helpful given how exhausted I was. He asked for my passport. I reached into my handle bar bag and... it wasn't there. Panic filled my body. Where was it? The receptionist, Txema, rang the campsite from last night. They had it. I calmed a little. At least it was somewhere known rather than at the side of the road somewhere in the last 100 km. In the exchange about money and key fobs this morning, I'd somehow forgotten the most important thing I needed. I had worried about this very thing and no it had happened on my 'last' day. What could be done about my passport? Txema suggested getting a BlaBlacar there and back. Or I could get a bus tomorrow at 8am or 3pm; it wasn't even a direct bus. Both options would take most of the day tomorrow and bring me back to Algeciras which would mean I wouldn't reach my flight in time the day after. I asked if it might be possible to get a courier to pick it up and deliver it to Málaga. That way I could cycle up the coast and meet it there. Txema told the night-shift campsite man that we would do that. He then tried booking online but it seemed that you had to call a number to find out if they could deliver it to their office in Málaga. The phone line was now closed until tomorrow morning. Txema told me he'd call me from home at 10am to let me know. It would all be OK, he assured me. Given my experience on this trip, I wasn't totally convinced but I didn't have the energy to think of anything else. I hadn't had a rest day since Aveiro and that was 10 days ago. In asking for help from Twitter I found myself spending an hour or so answering questions about it from several different people. Some just wanted to know more about my predicament. I realised that I needed to prioritise on people who could help. Up stepped my friend Thomas Robitaille. 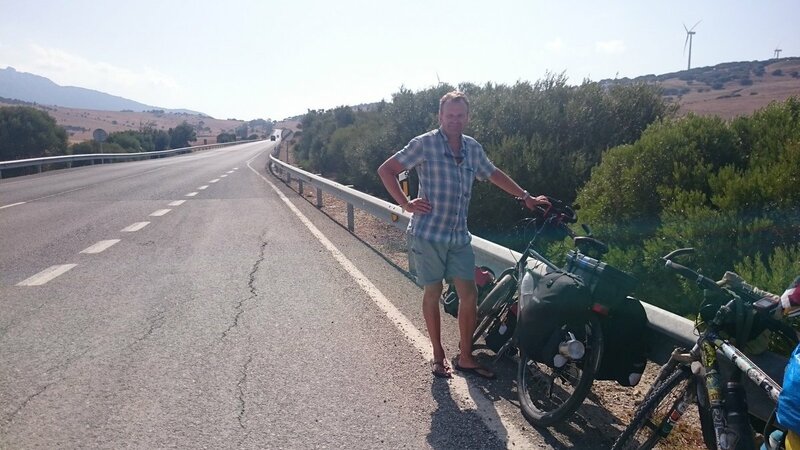 He looked up a range of BlaBlacar options for me and started looking at alternative ways to get from the west coast over to Málaga with a bicycle. I could no longer concentrate, or even string a proper sentence together, but Thomas was on the case. Sleep beckoned. I woke before dawn. It'd be nice not to have multiple insect bites every day. I'm constantly itchy in new places. It'd also be nice if ants stopped trying to get in my tent and stuff overnight. After a hard ride against the wind (which picked up overnight) I reached Rota in time for the 10am ferry. Except there wasn't a 10am ferry; it was Sunday. I'd forgotten. So I waited for the 11.25am ferry over to Cádiz. I got a coffee from a nearby cafe. The ticket office opened at 10.45 and it turned out the ferry was replaced by a bus service thanks to the strong winds (presumably due to Hurricane Ophelia). I can't take the bus replacement as that would be cheating. 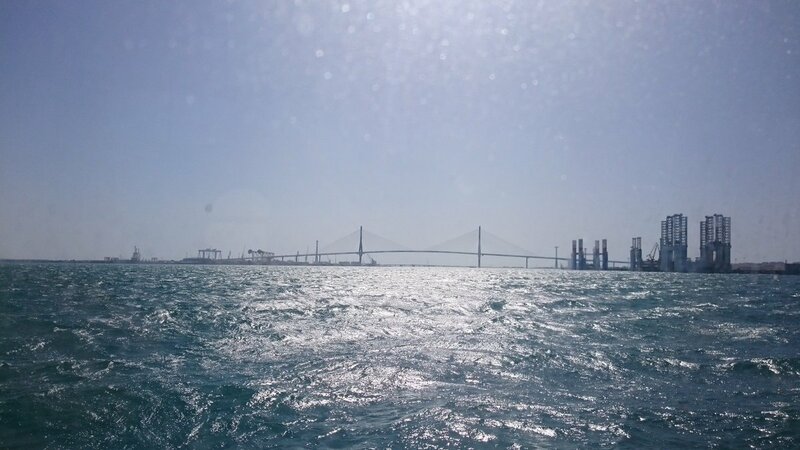 So I decided to miss Cádiz and push on against the wind. The next hour or so after Rota I had a really tough time cycling into strong wind. It was like being in a sand blaster. I hoped this didn't continue all day. 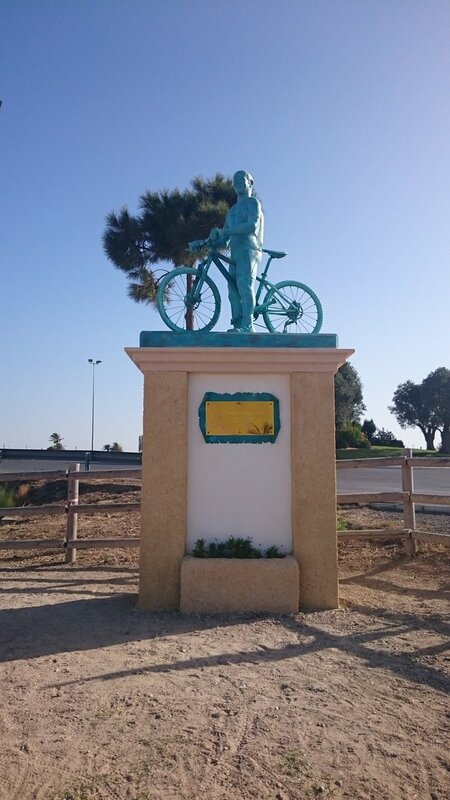 Cyclist statue. I don't know who this is. 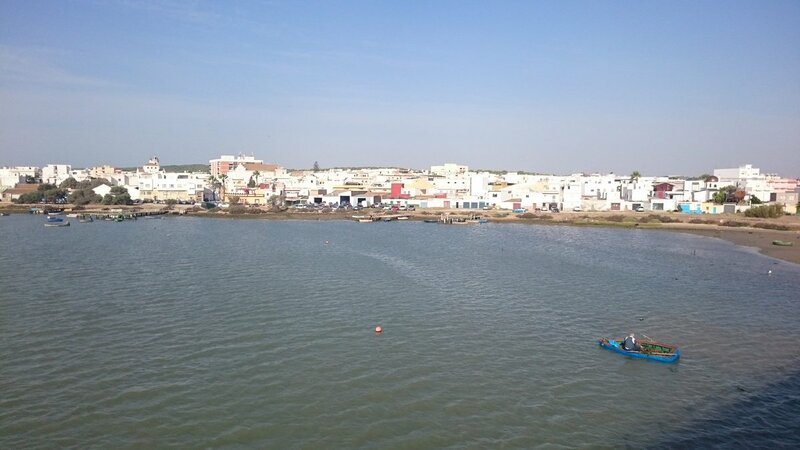 I reached El Puerto de Santa Maria and found that that ferry was running. So I made it to Cádiz after all. It was cheaper too. 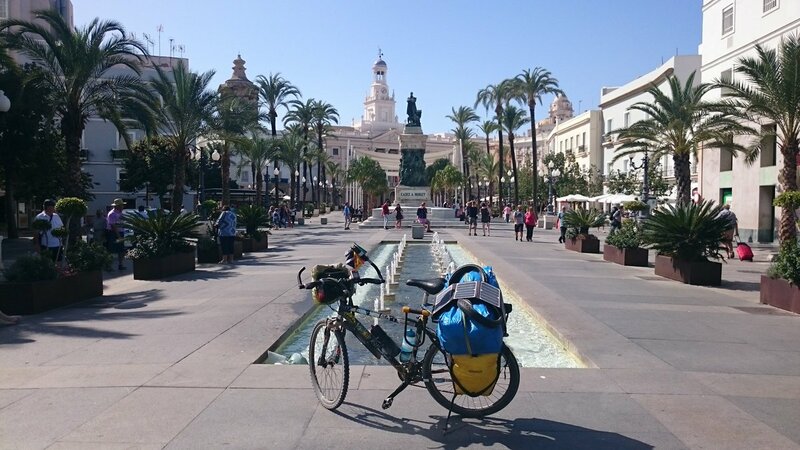 In Cádiz I asked the Tourist Information Office for advice on cycling south out of the city. Then I found an open Carrefour Express and had lunch. I gave a homeless man one of the sandwiches I made. He turned out to be from Germany. He fed part of the sandwich to the pigeons. The bread was on the way to stale. I ate mine. Time was getting on and so must I. Back into the heat and wind to find a mythical, bike-navigable, route south. Why are there so many motorway class roads all over the place? They are annoying. It suddenly felt like another country as I crested a hill. I hadn't gone 100km today but I had to stop. The next campsite finished its season last night. The next one after that was too far to get to in the gale before dark. 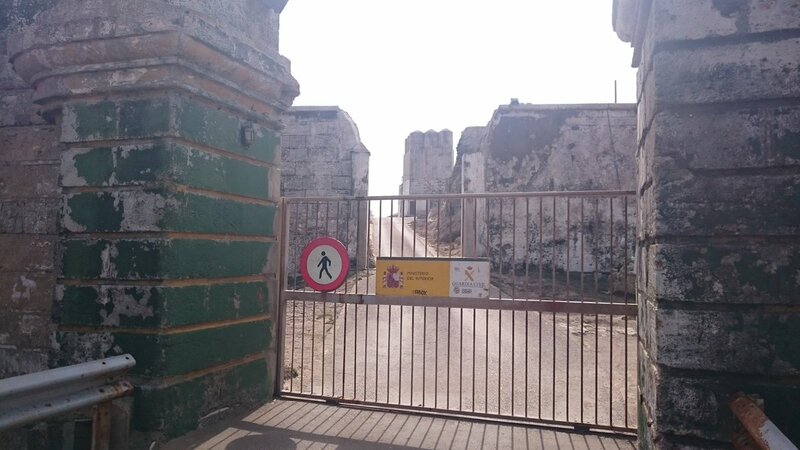 The one I'd arrived at had a big closed gate though. I tried calling the number but a man answered it and when I couldn't speak in Spanish he hung up. Drat. What would I do? As I sat on the ground a car pulled up and opened the gate. I thought these people might work here. They didn't. They were campers too. Never mind. I would camp now and pay in the morning. After putting up my tent and having a shower I discovered the reception was currently open. I handed over my passport and €10. I was official.